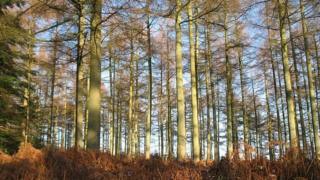 Thousands more Japanese larches are to be felled because of the continuing spread of disease. The 5,500 trees are in a forest near the Roman goldmines at Pumsaint in Carmarthenshire. Like millions of others in Wales, they are being killed by the disease phytophthora ramorum which causes fatal lesions on tree trunks. Natural Resources Wales (NRW) said native broadleaf species will replace the felled trees. NRW began removing trees when the pathogen was found in the Afan Valley, Neath Port Talbot, in 2010. The fungal disease is spread by spores released from infected trees and it has been found since in many parts of Wales, with the greatest impact in the south. It poses no risk to human or animal health and the felled trees can still be used. NRW has now been granted planning permission by Carmarthenshire County Council to build a road into the forest to enable the felling to go ahead later this year. Goshawk nests were found away from the proposed felling area and there was no evidence of red squirrels, NRW said, despite records of them living in the forest. Russell Jones, land management officer at NRW, said: "Protecting and maintaining Wales' forestry land is one of our biggest roles and tackling the spread of larch disease is a huge priority for us." He said the replacement native broadleaf species would "provide the woodland with more resilience as well as enrich the locally historic landscape".